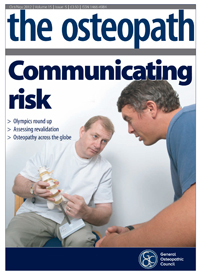 The Osteopath is the official magazine of the GOsC, with six issues per year. Read it for news; information about the new CPD scheme; practical guidance on the updated Osteopathic Practice Standards; research; courses and more. What exactly is an obective activity? Read reviews of research papers on restless legs syndrome by the Bristol research hub. Read research about the use of trigger points in the management of patients' symptoms. Your FAQs: how can I get a DBS check? Getting ready for the new CPD scheme in 2018: more than 350 osteopaths feed back on their current CPD activities plus tips on how to plan ahead and overcome common challenges like time pressures. Other features in this edition include: Complaints: are some osteopaths at higher risk? ; how to protect your patient data from cyber-criminals; supporting principals to mentor their associates; meet the new members joining the GOsC Council; how patients can self-manage long-term pain: latest research from NCOR. The lead article takes you through our new CPD website designed to answer your questions about the new CPD scheme and let you try out the new CPD resources. Other key features focus on equality law and your practice; maintaining boundaries on social media; the Osteopathic Leadership Programme; draft guidance for osteopaths on our fitness to practise process; research updates; osteopathy in the performing arts; and new NICE guidance on the management of low back pain. Baby talk: what can your advertising say about treating children and pregnant women? New guidance on advertising from the ASA is the subject of the lead article in this issue. Other key articles focus on recognising osteopaths’ areas of expertise and protecting your practice against phishing. 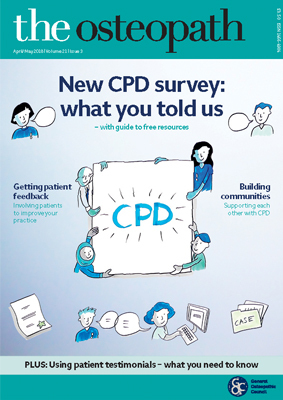 We also look at the progress of early adopters of the new CPD scheme; the importance of keeping your practice details up-to-date; our work on protecting the title ‘osteopath’; GOsC resources in Welsh; and the research journals available to you free-of-charge. In ‘In Practice’ we examine what to do if you want to share sensitive patient information with another health professional or you are asked for it by someone else. 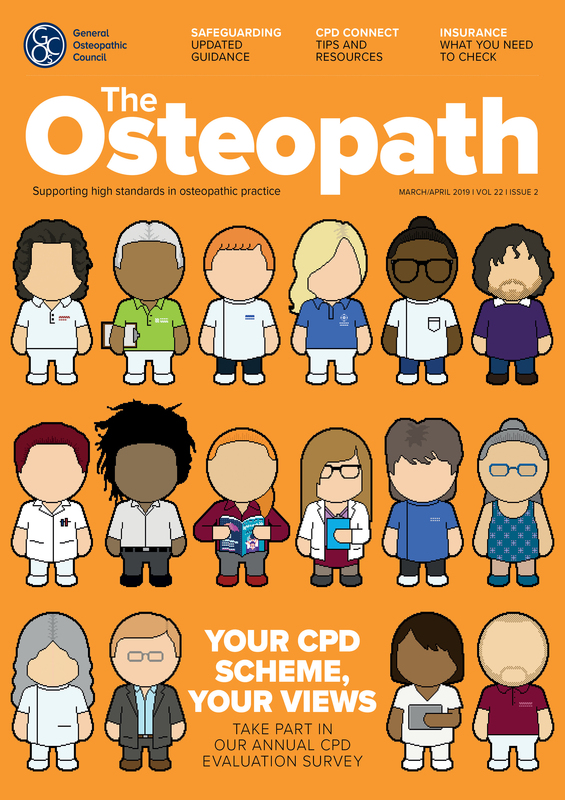 Elsewhere in this issue we bring you updates on the new CPD scheme, Council and committee recruitment and osteopathy research.Other key articles include: the potential for regulation to play a more supportive role; the treatment of headaches, what to do if you want to retire or leave the Register and selling a human skeleton. The benefits to osteopaths of joining our community of early adopters, clinical audit as a way of obtaining feedback on practice and the types of issues that prompted patient concerns and complaints in 2015 are key features in this issue. Other articles include: data security; mentoring for new graduates and making practice websites work for you and your patients. Other topics in this issue include: Brexit and osteopathy; assessor vacancies; patient reported outcomes and osteopathy at the Olympics. An app that collects feedback directly from patients to demonstrate the outcomes of osteopathic care is the focus of our leading article. 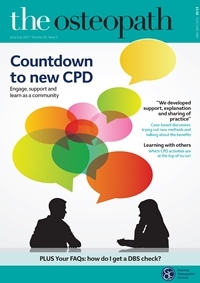 Other key articles include the rollout of the new CPD scheme, how to become one of the CPD ‘early adopters’, and how long patient records should be kept. Topics in this issue also include: Council and committee vacancies; improving the patient experience; patient dignity and the standing examination; animal osteopathy and starting a new regional society. 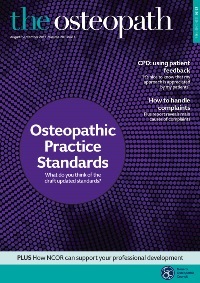 Have you added your voice to our review of the Osteopathic Practice Standards yet? This issue gives an update on the review. Other key articles include: the new CPD scheme and becoming an early adopter; an introduction to our new, slimmed-down Council; and a preview of our forthcoming guidance for witnesses at hearings. Half the UK’s osteopaths belong to local osteopathic groups, whose importance to the profession is our focus this issue. 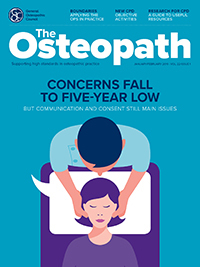 Other articles cover our review of the Osteopathic Practice Standards, the use of patient data for e-marketing, peer observation, the National Osteopathic Archive, and how reflection benefits practice. Comments received during our 2015 consultation on the new CPD scheme, and an outline of next steps in implementing the scheme; patients’ views on candour and raising concerns about their treatment; GOsC support for final-year students; managing patient data; assessing capacity to consent; and soliciting patient feedback. Common concerns raised by patients, and how best to gain patients’ informed consent and involve them in decision-making; key GOsC activities during 2014-15; complying with the duty of candour in practice; prioritising and planning your CPD; how to act on suspicions of child abuse; and osteopathy and the performing arts. More findings from our research into public perceptions of osteopathy - what do patients expect from their treatment, and what information should you provide for new patients? Plus: deciding your CPD priorities; recruitment for Council and fitness to practise roles; and the use of patient feedback. Research into public perceptions - how much confidence do people have in osteopaths, and what do prospective patients want to know? Plus: guidance on advertising standards; publicising osteopaths' specialist interests and expertise; the European Standard on Osteopathic Healthcare Provision; and the role of 'values-based practice' in shared decision-making. 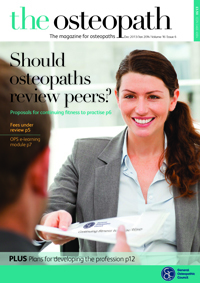 Findings from research into how osteopathy can best be regulated; answers to common questions about the proposed new CPD scheme; how we investigate complaints, and details of complaints dealt with in 2014-15; guidance to prepare osteopathy students for practice; and results from our annual survey of new registrants. Launching our consultation on proposals for a new CPD scheme; helping osteopaths to develop leadership skills; how the GOsC seeks patients' views; the Francis report, two years on; new insurance rules; common issues in patient complaints; and funding research into osteopathy's effectiveness in treating children. How communication is at the heart of the GOsC's proposed new CPD scheme for osteopaths; incorporating values into osteopathic practice standards; update on the Osteopathic Development Group's work; the importance of regional groups; identifying children at risk of abuse; and sharing information about challenging situations. Details of the professional duty of candour, introduced following the Francis Report into Mid-Staffordshire Hospital; 'pathfinder groups' help to shape the development of continuing fitness to practise; osteopaths’ advertising; Patient Reported Outcome Measures (PROMs); the National Osteopathic Archive; and standing at work. A special issue, with information about funding for research into osteopathy, making a research proposal, 'research hubs' and how to get involved in research. Plus: seeking views on the effectiveness of regulation; continuing fitness to practise update; and the GOsC’s performance review by the Professional Standards Authority. Changes to the law on regulation? Consultations on whistleblowing and enforcement of title; research into effective regulation; Government review of healthcare professional regulation; improving CPD; understanding fibromyalgia; withdrawal of certification mark; what counts as CPD; Osteopathy Development Group updates. Feedback from patient and public focus groups; work of our fitness to practise committees; updates on the continuing fitness to practise scheme and research into effective regulation; research into advanced clinical practice; osteopathy at the Winter Olympics; interpreting research; preserving patient confidentiality. Helping osteopaths to show patients they are regulated healthcare professionals; communicating risks and benefits; lessons from the Francis Report; registration fee reduction; new research commissioned on the effectiveness of regulation; how to register in Australia; continuing fitness to practise. The role of osteopathic organisations and regional groups in the continuing fitness to practise process; new fitness to practise and consent guidance; fee reduction and insurance consultations; e-learning to support the Osteopathic Practice Standards; resources for new graduates and final-year students; projects to develop the profession; the law on giving injections; FORE meeting in Malta; pain medications; the enhanced IJOM research resources package. Strengthening the regional infrastructure of the osteopathic profession; future changes to professional indemnity insurance; recruitment to three GOsC committees; research into the effectiveness of regulation; changes to the CPD audit process; osteopathy in Portugal; consultation on a European osteopathic standard; early signs of bone cancer. Financial report for 2012-2013; how the GOsC proposes to support development projects; the evolution of revalidation; a reminder about advertising; osteopathic statistics; seminar on continuing fitness to practise; new GOsC data retention policy; developing NHS osteopathy in Wales; osteopathy in Canada. The Francis Report: What can the profession learn? Implications for the osteopathic profession of the Francis Report on the failings at Mid Staffs Hospital; Patient Partnership Group; professionalism in practice; CPD audits and resources; article by Maurice Cheng, new CEO of the British Osteopathic Association; starting out in practice. Fitness to practise report 2012-13; interview with the Chair of Council; evaluating the revalidation scheme pilot; update on the development of the profession programme; news from the National Council for Osteopathic Research, new app enabling osteopaths to read the International Journal of Osteopathic Medicine on mobile devices. How renewing registration and submitting CPD online saves time and money; reduced fees for 2013-2014; new Council members; new GOsC Corporate Plan; initial findings of the revalidation pilot; consultation on sanctions in fitness to practise cases; dealing with ethical issues. 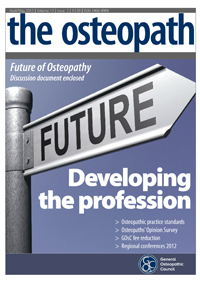 This issue also contained an insert, A development agenda for UK osteopathy: a joint statement from organisations including the GOsC about the future development of the osteopathic profession. Feedback received through the osteopaths’ opinion survey and how we are responding; revalidation update; auditing CPD; non-practising status; local professional networks; what’s new with IJOM; Any Qualified Provider; using social media safely. Results of the Clinical Risk Osteopathy and Management (CROaM) study; explaining benefits and risks to patients; Olympics round-up; assessing revalidation; osteopathy worldwide; consent guidance consultation; the IJOM Plus research journals package; coloured flags in osteopathic practice; GOsC financial report for 2011-2012. How to keep your practice standards up to date following the introduction of the new Osteopathic Practice Standards on 1 September; regional conference round-up; osteopaths’ opinion survey findings; new practice information leaflets; the GOsC’s performance review report. o zone resources to support the introduction of the new Osteopathic Practice Standards; more about professionalism in the OPS; appointment of assessors for the revalidation pilot; public information leaflets; osteopathy at the Olympics; the Council of Osteopathic Educational Institutions; osteopathy in Europe. GOsC discussion document UK osteopathy: Ten questions for the next ten years; Section D (Professionalism) of the Osteopathic Practice Standards; pitfalls for health professionals of social networking; 2012 GOSC regional conferences; fitness to practise report 2011/2012; preparing students for practice; conviction of a practitioner falsely claiming to be an osteopath; Law Commission review of healthcare regulation. Section C of the new Osteopathic Practice Standards, focusing on patient records; consultation on a GOsC fee reduction; 2012 regional conferences; revalidation round-up; announcing the GOsC Facebook page; introducing the new Chair of Council. Putting into practice the Osteopathic Practice Standards; revalidation update; IJOM Plus readership survey; CPD discussion document; new Chair of the GOsC; GOsC Patient and Public Partnership Group. Findings of the Osteopathic Patient Expectations Study; helping osteopaths prepare for the new Osteopathic Practice Standards; revalidation pilot; the GOsC’s CHRE performance review; House of Lords enquiry into healthcare professionals' mobility; June meeting of the Regional Communications Network. Reducing the cost of regulation; recruiting a new GOsC Chair; consultation on guidance about student fitness to practise; looking forward to the revalidation pilot; recent International Osteopathic Education conference. Fitness to Practise report 2010; consultation on the GOsC Welsh Language Scheme; online renewal of registration; new Osteopathic Practice Standards update; joining the register under the new powers; developments in osteopathic regulation in Europe. Plans to pilot our revalidation scheme; reviewing procedures for assuring the quality of osteopathic education qualifications; helping osteopaths comply with advertising law; revised Osteopathic Practice Standards and work around osteopathy students' fitness to practise; new online research resources; interview with Tim Walker. Helping osteopaths put new ‘Knowledge, skills and performance’ osteopathic practice standards into practice; draft revalidation scheme pilot; IJOM Plus package of research journals; our CPD Discussion Document; guidance on interim suspension orders; the new GOsC Chair; recruiting a Chair of NCOR; international osteopathy. Consultation on revised osteopathic practice standards; review of GOsC activities in 2009-10 and summary of annual accounts; introduction to Tim Walker; update on the revalidation scheme; overview of current and forthcoming research; developments in osteopathic regulation in Europe. Forthcoming consultation on our practice standards; update on the development of the revalidation scheme; quality assuring standards of training; research into osteopathic practice; our performance review; update on the Vetting and Barring Scheme. Assessment criteria for our draft revalidation scheme; recruiting a new Chief Executive and Registrar; developing reciprocal registration arrangements with Australia and New Zealand; student fitness to practise; Regional Communications Network; pan-European standards for osteopathy. Latest news on revalidation; handling the early stages of fitness to practise complaints; new e-bulletins for osteopaths; forthcoming Regional Communications Network meeting; Forum for Osteopathic Regulation in Europe update; new ‘Statement of Fitness to Work’; the Government’s new vetting and barring scheme. 2009 fitness to practise report; updates on developing a revalidation scheme, revised osteopathic practice standards, and a scope of practice; the OPEn project; review of quality assurance processes for training courses; reciprocal arrangements with Australia and New Zealand; volunteering at the 2012 Olympics and Paralympics. Want to advertise or subscribe? download a subscription form, complete and return it to us.